← Astronaut Buzz Aldrin July 1969, Apollo 11: spacecraft eyes (S/C/E) or is it zero gravity trauma? 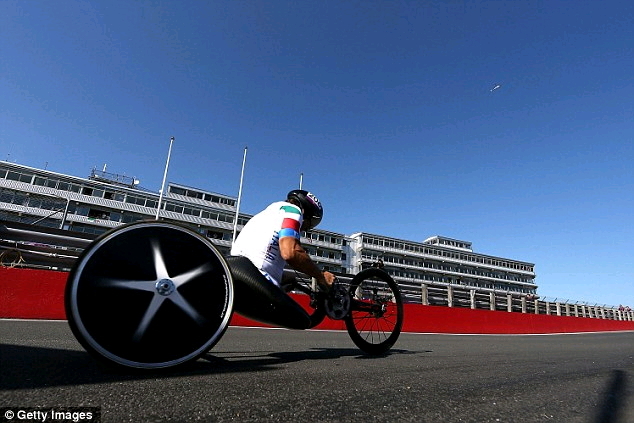 Alex Zanardi is my hero. 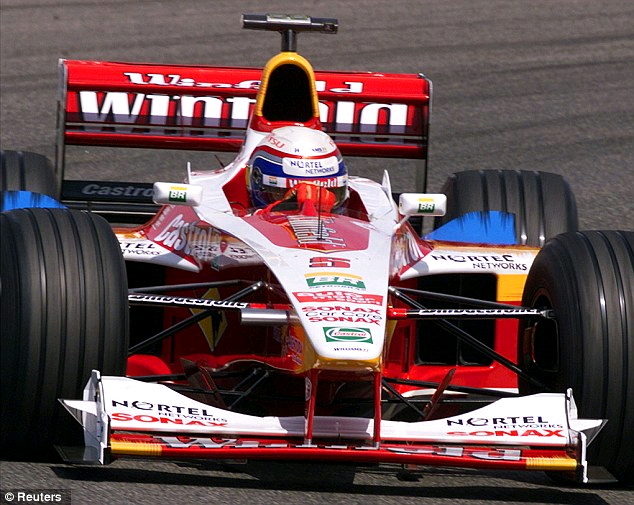 Eleven years ago leading at a CHAMP car event in Lausitz, Germany, Alex Zanardi’s Reynard-Honda was hit by Alex Tagliani’s racecar at 320 kph as Zanardi excited from the pits, instantly slicing his chassis in half in a horrific accident that also severed off both his legs. During the helicopter ride to the trauma center he was given his last rites. Only two pints of blood were left in his mangled body. The surgeons had to restart his heart seven time in the course of the surgery trying to repair to his massive wounds. 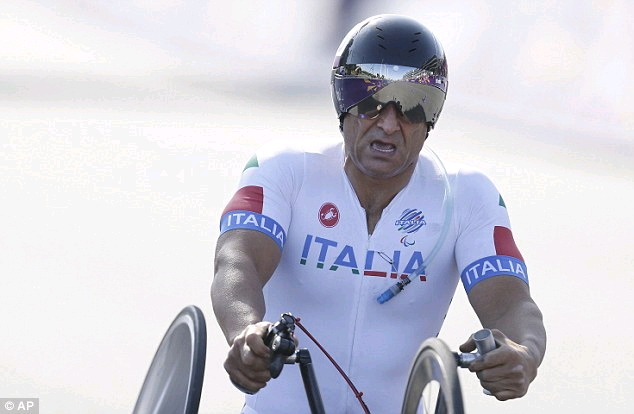 Today, 45 year old Alex Zanardi, drove his own design of one man race machine during Handcycling Time Trials at Brands Hatch that he set fastest lap on years ago, by winning a Gold Medal in the 2012 Paralympic Games, finishing 27 seconds faster than the nearest competitor, German racer silver medalist Norbert Mosandl, with American, Oscar Sanchez taking the bronze medal. In his own words he mixes a feeling of sadness with utter joy to the enormous amount of hard work for his recovery, learning to cope with a loss of both legs, not feeling sorry for himself. It is a astonishing accomplishment. ‘When you choose the right horizon in life and you start to be pushed by your passion, every day is a great opportunity to meet happiness. 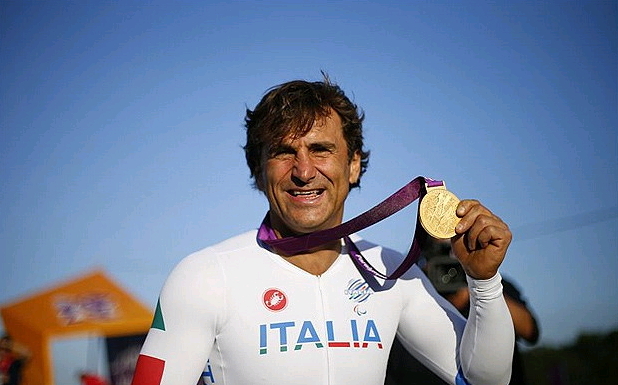 What Alex Zanardi had to accomplish is teach his brain how to re-balance itself completely just above his torso without any lower proprioceptive capacity, essentially rewiring his entire balance apparatus within his brain. ‘It seemed a stupid thing to do to drop everything. It was against all odds. But it’s not the first crazy thing I did in life. In the end I was right. Reflecting on my own journey during the last year I have advanced a lot but not as much as Alex Zanardi has, so that is the challenge in front of me right now. I will work diligently toward improving my knowledge and skill set to understand brain concussion deeply to not give up, that is the big lesson that Alex Zanardi has for all of us. Chase your dreams to make them happen no matter the pain no matter the disappointment, no matter the setbacks. Seek out the happiness of all your deserved accomplishments. “I can remember him getting up on stage at the Autosport Awards at the end of that year, (after recovering from his crash) on his prosthetic legs, and the atmosphere was incredible. It is an overused word but the manner in which he has come back from his accident is nothing short of inspirational. 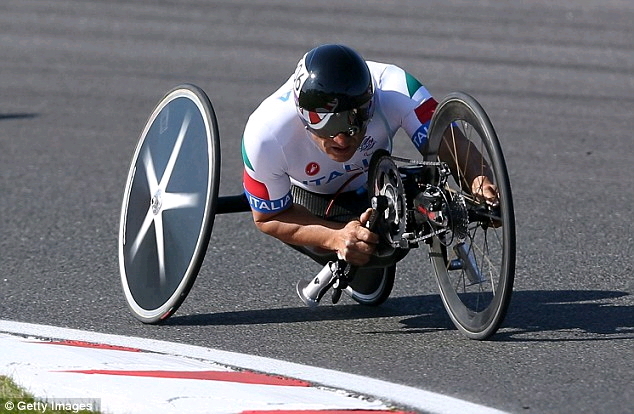 More than just his achievements, which have been considerable — a return to professional motor racing, wins in German touring cars, an F1 test, and now his hand cycling career — it is his attitude to life. His boundless energy. He sees his disability not as a life-sentence but an opportunity. He says now that the crash was his “ticket” to the Paralympics.